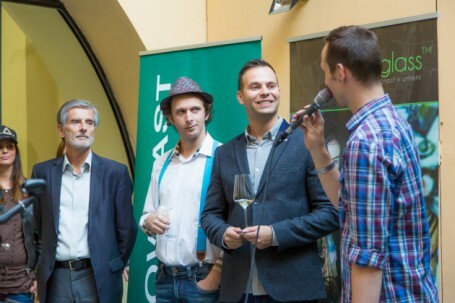 Prague, September 11, 2015 – Internationally acclaimed artist, Luka Brase, and beginning talent, Jozef Gašpierik, in cooperation with Flow East, opened on Wednesday, 9th September the exhibition “The Return of the Lost Son”. Peter Weiss, Slovakia Ambassador in the Czech Republic attended the exhibition´s opening party and the music performance was given by Melanie Scholtz, from South Africa. The artworks will be on display until 10th October in the Ericsson Palace located at Malé náměstí in Prague. This exhibition is a part of a project for the support of emerging Slovak artists abroad, and marks the launch of Flow East´s Art Hub, which offers ateliers free of charge for young, talented artists. “The presented works are a reflection of our trips over the past five years – a visual diary that captures my path in life. Our aim, together with my friends, is to create valuable projects that reflect our society and I am happy to have found a partner in Prague, Flow East, that understands and supports our common cause,” said Luka Brase. Luka Brase, reknowned artist, painter and photographer, who is currently on a European tour, is coming to Prague after his last exhibition in Norway. He brings his works, such as Paris, Tree of Life, and Story that are recognized throughout Europe. In cooperation with Jozef Gašpierik, he has created a unique painting on glass, which is being presented at the exhibition, as well as works of the aforementioned author, for whom it is the debut exhibition in Prague. “Flow East is beginning its Art Hub project with this exhibition. We pride ourselves on the support of projects for the public, and have always strived for first class renovation of historical buildings; this is yet another opportunity for us to connect the two. Finally, the exhibition is a celebration of the 25th anniversary of Flow East on the Czech market,” says James Woolf, CEO of Flow East. Jozef Gašpierik’s work is a unique combination of artistic styles; a perfect fusion of acrylic and ink applied to the canvas. His biggest inspiration is women as a whole and scenes from everyday life. His works are in many cases the visual expression of his inner imagination. Both authors bring contemporary art and artistic innovations embedded in the classical environment, creating a perfect artistic contrast and cultural experience. Jozef Gašpierik will present the design of Arte Vine limited edition at the exhibition.